Artist impression of Sollasina cthulhu. Credit: Elissa Martin, Yale Peabody Museum of Natural History. Paleontologists have described an ancient species that bears an uncanny resemblance to Cthulhu, a monstrous character created by author H.P. Lovecraft. 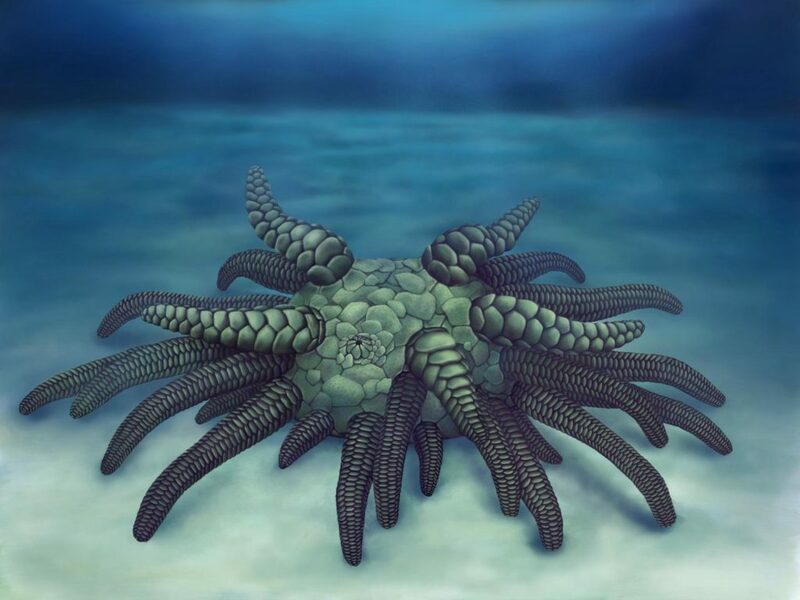 The researchers performed a 3D reconstruction of the 430-million-year-old fossil, which they named Sollasina cthulhu, finding that it is more closely related to sea cucumbers than sea urchins. The menacing-looking fossil was found in Herefordshire, UK, which is famous for preserving both the soft as well as the hard parts of fossils. The excellent preservation of fossil specimens is owed to the entombed of Silurian (443-416 million years ago) marine life in volcanic ash, causing calcite precipitation. The process happened so fast that soft parts didn’t have time to decay, becoming preserved as sparry calcite. British and American paleontologists used a special method to perform their 3D reconstruction, which involves grinding the fossil layer-by-layer, and taking a photograph at each stage. The hundreds of sliced images are then stacked together to reveal a digitally reconstructed “virtual fossil”. Although Sollasina cthulhu was only 3 centimeters wide, its relatively long tentacles gave the animal a menacing appearance. These tentacles, the researchers believe, were used to capture food and crawl over the seafloor. This is a 3D reconstruction of Sollasina cthulhu. Credit: Imran Rahman, Oxford University Museum of Natural History. The 3D reconstruction also revealed an internal ring, which likely played an important part of the water vascular system. This was the first hint that the 430-million-year-old marine creature was likely related to sea cucumbers, who possess similar fluid-filled canals that carry nutrients and enable movement. 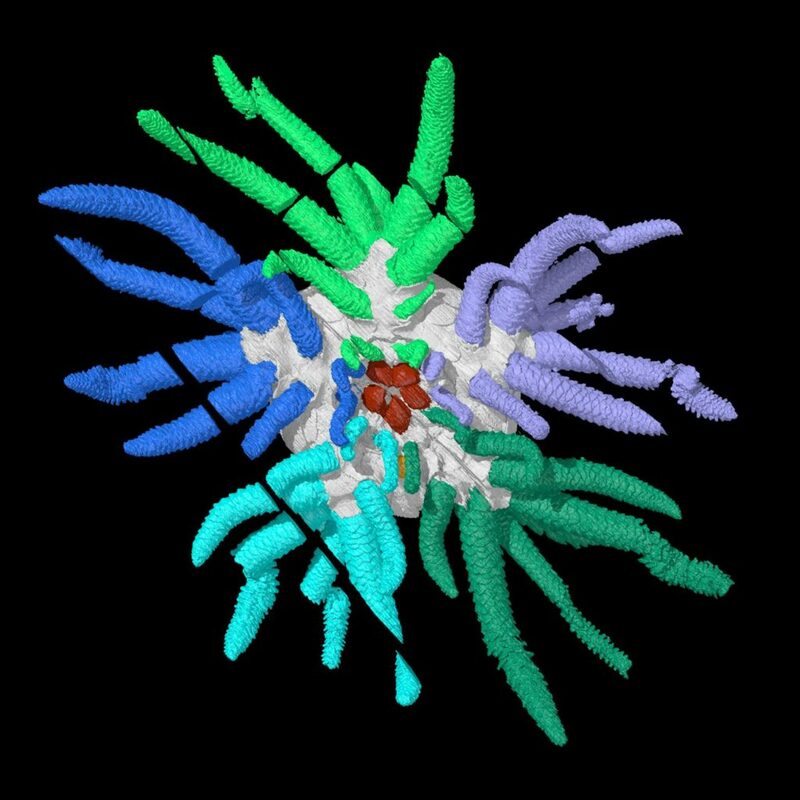 “Sollasina belongs to an extinct group called the ophiocistioids, and this new material provides the first information on the group’s internal structures. This includes an inner ring-like form that has never been described in the group before. We interpret this as the first evidence of the soft parts of the water vascular system in ophiocistioids,” Dr. Imran Rahman, Deputy Head of Research at Oxford University Museum of Natural History, said in a statement. “This helps us understand the changes that occurred during the early evolution of the group, which ultimately gave rise to the slug-like forms we see today,” Dr. Jeffrey Thompson, Royal Society Newton International Fellow at University College London and co-author of the new study, said in a statement.